Teething is a sequential process when milk teeth emerge through the gums of an infant. It is a very painful process, and as a parent, it is your duty to take precautions and utmost care of your child during this period. It generally starts at the age of 4 to 6 months, and you need to make important measures to ensure that your baby doesn’t catch any bad habit that may take forever to quit. At this age, it is the perfect time to introduce teethers to your babies whenever you start noticing your baby putting their tiny fingers in their mouth. Teething toys can help in easing the pain of your baby, that they start feeling at the age of 4 to 6 months. Teethers help in keeping their mouth busy, and so here we have curated a list of best baby teethers available online. This fish-shaped teether is something babies are going to love. They are perfectly shaped and manufactured in a way that is very convenient to hold. It is also perfectly apt for a baby who is 3 months or older. This unique shape helps in providing ultimate comfort to the gums. It comes with a carrying case that maintains the hygiene level of the teether because babies usually tend to play with the teethers as a toy, when not in use. This feature makes it one of the top preferred teethers for babies. Includes Hygienic carrying case to keep it clean when not in use. Perfect size and shape are hence easy to handle. Super soft and 100% Silicon. This product won’t retain the cold temperature for a long time. When the bristles of the teether massage the gums, it assists the eruption of teeth from the gums. The texture of the teether helps in soothing and cleaning the gums, plus it has a carrying case that maintains hygiene. They are very tiny and manufacture in a way that can easily fit in little hands of the baby. The baby finger size of the teether is easy to grab and comes with a non-choking design. Also, this is made from completely safe to use silicone that is free from BPA and PVC. They are even safe to use in microwaves, dishwashers, boiling waters, and sterilizers too. It’s a highly recommended teether for toddlers. Top-rack dishwasher and freezer safe. Baby finger sized and is easy to clean. Multiple points for grabbing and holding. Handle it properly as its fingers can harm baby’s eye or nose. It is very convenient to hold, and it comes with endless options to use or bite. This toy is one of the best picks because the little nubs can also reach the tiny places inside the mouth of a baby like incoming molars. The Winkel is not less than a delight and something you must get for your baby. It comes with beautiful colors that can never fail to grab the attention of your little one. It comes with a beautiful loop design and very light in weight. It is perfect for babies up to 2 years of age, and that’s why it’s among the best teethers for your baby. Lightweight maze of soft and continuous tubes. Colorful tubes are easy to grasp and hold. It’s teething loops are soft and elastic. 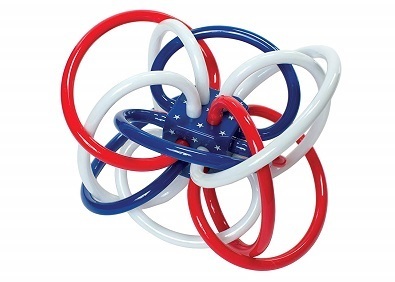 Infant toy promotes clutching and two-handed play. The middle piece provides a cube that contains a pleasing rattle sound. Can be refrigerated for a long time. Plastic loops are BPA free. As its colorful, it is very delightful and visually attractive for the babies. It also consists of rattling beads inside the centerpiece that are loud for the babies to attract them towards the sound, which they can enjoy. 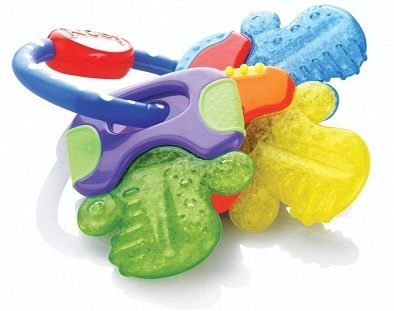 It is a very colorful teether that not only offers a dual surface but also supports the outbreak of middle, back and front teeth. The keys are made from soft material that is easy on the gums of infants. It carries a nontoxic gel that tastes soothing to babies and provides mild cooling to the gums. The textured surface helps in stimulating sore gums of babies. The bright colors attract babies a lot visually. This is completely free from BPA, Phthalate, PVC, and Latex. Contains a non-toxic PureIce Gel. Stays cooler for a longer time helps soothing sore gums. BPA Free, Phthalate Free, PVC Free, Latex Free. Teething nubs help massage tender gums. Bright colors help with eye-hand coordination. It is bright and colorful. Also its resistant to cold. Teething nubs help in giving a tender massage to the gums of babies. It can be a combined exercise for teeth, gums, and hands altogether. It gives relief to the babies from pain. It also helps in providing a fresh surface that can support chewing which encourages growth and eating habits in a baby. It provides soothing properties to the gums of a baby. The habit of using teethers will help baby not to put other harmful or pointed things in their mouth that may hurt them. It is considered to be as one of the most important landmarks in the growth of a baby. It helps the parents to stay calm because they don’t need to worry that their baby is going to get harmed in any way. Thus, it’s better to get a teether for a baby, even from a parent’s perspective. These best teething toys for babies are available on Amazon.com, and they are very pocket-friendly. They are amazing products specially manufactured to keep your baby free from any harm.